Photo. Buying fruit in New Zealand. 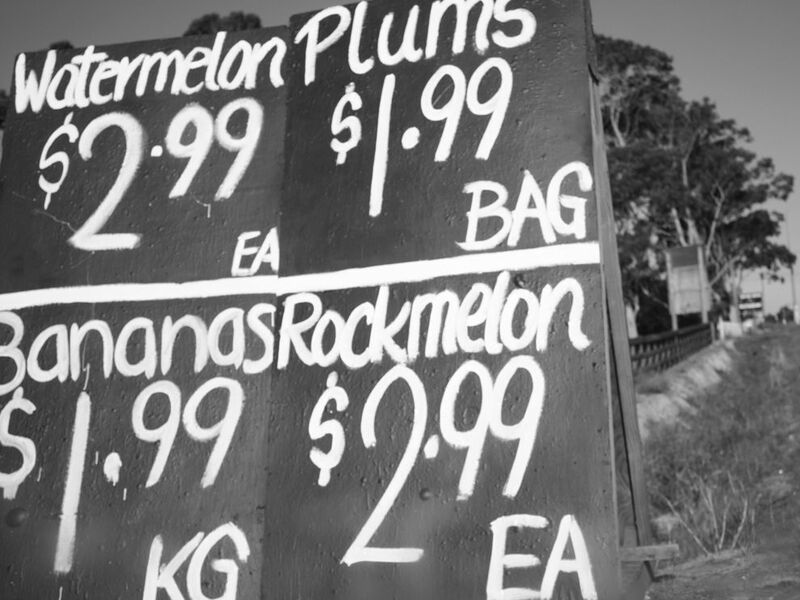 A roadside sign advertises prices, a common form of quantitative data, for fruit in a rural area of New Zealand. Rockmelon is another name for cantaloupe. These fruits are being sold at a roadside market in New Zealand. The unit of currency used in New Zealand is the New Zealand dollar (NZD). On Jan. 9, 2012, one New Zealand dollar was worth 78 cents in American money (.78 U.S. dollar (USD)). Like most of the world, New Zealand also uses the metric system. (The United States, Liberia, and Myanmar (Burma) do not use the metric system.) The bananas advertised in this sign are weighed in kilograms (kg). One kilogram is equal to 2.2 pounds, the unit of weight used in the United States. A customer is buying a watermelon. How much will this cost in New Zealand dollars? How much in U.S. dollars? A watermelon will cost $2.99NZD, or $2.33USD. The sign gives the value of a watermelon as $2.99NZD. To calculate the price in U.S. dollars, multiply the New Zealand price (2.99) by the value of the U.S. dollar (.78). A customer is purchasing three rockmelons (cantaloupes). How much will this cost in New Zealand dollars? In U.S. dollars? Three rockmelons will cost $8.97NZD, or $7.00USD. To calculate the New Zealand price, multiply the price of one rockmelon ($2.99) by the number the customer wants to buy (3). To calculate the U.S. price, multiply the New Zealand price (8.97) by the value of the U.S. dollar (.78), and round to the nearest hundredth. A customer is buying 2 kilograms of bananas. How many pounds is this? The customer is buying 4.4 pounds of bananas. To calculate the number of pounds, multiply the number of kilograms (2) by the conversion value (2.2). The customer buying 2 kilograms of bananas is now ready to pay. How much do those 2 kilograms of bananas cost in New Zealand dollars? In U.S. dollars? Two kilograms of bananas cost $3.98NZD, or $3.10USD. To calculate the price in New Zealand dollars, multiply the number of kilograms (2) by the given price (1.99). To calculate the price in U.S. dollars, multiply the New Zealand price (3.98) by the value of the U.S. dollar (.78), and round to the nearest hundredth. A customer is buying a bag and a half of plums. How much will this cost in New Zealand dollars? In U.S. dollars? A bag and a half of plums will cost $2.99NZD, or $2.33USD. To calculate the price in New Zealand dollars, multiply the number of bags (1.5) by the given price (1.99), and round to the nearest hundredth. To calculate the price in American dollars, multiply the New Zealand price (2.985) by the value of the U.S. dollar (.78), and round to the nearest hundredth. A customer is buying a kilogram of bananas, a bag of plums, and a rockmelon. What is the price in New Zealand dollars? In U.S. dollars? The price is $6.97NZD or $5.44USD. To calculate the New Zealand price, simply add the given prices of the fruit. To calculate the U.S. price, multiply the New Zealand price by the value of the U.S. dollar (.78), and round to the nearest hundredth.